A number of sports car makers were experimenting with the idea of adding a large engine to a small car in the latter part of the 1960's. At the forefront of this trend was the AC Cobra and, to a lesser extent, the Sunbeam Tiger. In the UK, the existing small sports cars with their equally small engines were out of touch with the major export markets. The first models to try to break the mould were the Triumph GT6 and MGC, but both failed. Ken Costello, a well respected private entrepreneur, realised the potential of adding a larger engine to the MGB. In fact, the car was originally designed to use a V4 engine, which was larger than the B-Series unit finally chosen. In the early 1970's, he was successfully marketing some 200 MGB convertibles and GT's with a 157 bhp version of the Rover V8 engine, and at a premium to the selling price of the later MG production model. MG subsequently asked him to produce a prototype MGB GT V8 sports car using the Rover 3.5 litre V8 engine which they had recently developed. He modified this engine to produce a unit that developed an impressive 180 bhp. However, prior to the final launch of the new MGB, the supply of Rover V8 engines to him was withdrawn (to prevent competition). In 1968, with the advent of British Leyland, MG decided to fit an alternative engine into the MGB in response to the mistakes made with the MGC. They had the choice of two different V8 engines - the Rover 3.5 litre unit, and Triumph's own 3 litre unit as used in the Triumph Stag. However, the latter engine was beset with technical problems, such as heads that tended to warp due to incorrect head gaskets that restricted the flow of water, so leading to overheating. On the other hand, the Rover engine successfully powered a number of cars, such as the Land Rover and Morgan Plus 8. In fact, it was initially fitted to the Rover P5B 3.5 litre saloon car, back in 1967. Furthermore, it was decided to incorporate this engine only in a fixed head coupe version. The reason behind this was that, since the US was seen as the principal export market, the advent of their stringent emission and safety regulations could result in the demise of the convertible. Another reason was that fixed head coupes were often perceived as being more elegant than the corresponding convertible. However, for use in performance cars, the original V8 engine would need modifications to strengthen the block, together with further improvements. Since the Rover V8 engine used an aluminium block and cylinder heads, it actually weighed less than the steel B-Series unit used in the MGB. The car's engine bay could easily accommodate the Rover unit without the significant chassis modification necessary when the large 3 litre, 6-cylinder engine was added to produce the MGC. 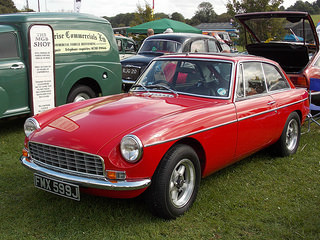 The result was that the presence of the V8 engine did not, in any way, adversely affect the handling characteristics of the car, as was the case with the MGC. However, MG decided that a less highly tuned version than that produced by Ken Costello would be appropriate. The final version that was used in production developed 137 bhp at 5000 rpm and 193 lb/ft of torque, and two SU carburettors were added. It has been suggested that the reason the company chose a Rover engine with a lower compression ratio and a correspondingly lower 137 bhp output was to create, for marketing purposes, a separation between the new MGB and the more expensive Triumph Stag. 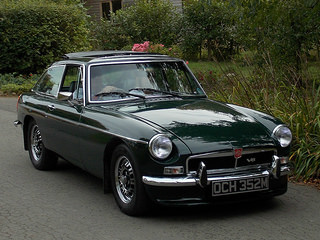 In 1973, the MGB GT V8 sports car was launched. The main criticism at the launch was that both it and the standard MGB BT were too alike, externally, especially since the new car cost more. 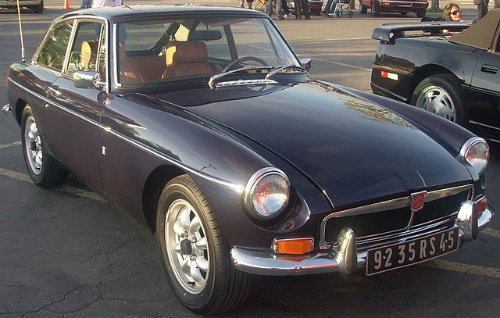 No left-hand drive models of the MGB GT V8 sports car were ever built for export to the US. British Leyland indicated that production capacity would be insufficient to satisfy the additional requirements of the US market. An alternative explanation was that BL management was concerned that the new MGB would draw attention away from other models being produced, especially the 3 litre, V8 engined Triumph Stag. The fact that the new car had to be withdrawn prematurely was linked to it being launched during the worldwide fuel crisis of 1973, which was the death knell for many large engined cars. 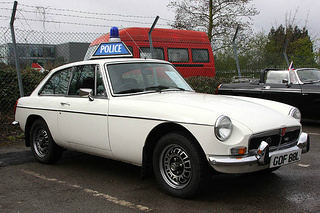 Sadly, the MGB GT V8 sports car was no exception, since it returned only 20 mpg. Furthermore, since Rover did not offer the V8 engine in a variant that satisfied US emission regulations, this precluded it from export to the US, a vital and necessary market. Initially, the new car was well received by the motoring press in the UK but, by 1976, and the introduction of black polyurethane safety bumpers, sales plummeted. In fact, in 1976 when production ended, only 176 of the cars were built. A 1973-76 MGB GT V8 in good condition would fetch anywhere between £14,000/$22,000 and £18,000/$29,000.